When the Stanley twins designed a boiler for their steam cars their design had to satisfy two highly important criteria as well as being safe. The boilers had to withstand steam pressures of 600 PSIG while being as light as possible. For a boiler the size the Stanley’s needed to withstand 600 PSIG steam pressures would have required steel nearly an inch thick. A boiler constructed with this amount of steel would make it far too heavy for automobile use. Thus they decided to use the same technique that had been employed with artillery cannons. Wrap the barrel with layers of wire which has extreme strength and light weight. This construction allowed the Stanley Twins to safely construct a boiler with thin sidewalls that was still extremely strong and lightweight. No Stanley boiler has ever been documented to have exploded in the violent and life threatening manner in which a steam locomotive or traction engine boiler has been known to explode. The Stanley boilers used three layers of 0.045” diameter high tensile strength wire for wrapping their boilers. To increase the safety margin it was decided that the new boiler would be wrapped with 0.054" diameter piano wire offering a minimum of 300,000 pounds of tensile strength. Calculations for the boiler indicated for the 14" width of boiler shell between the two end steel bands that 18.5 strands or wraps per inch would be required. Figuring the diameters to be wrapped: 23.054" for the first layer, 23.108" for the second layer, and 23.162" for the third layer, the circumferences of 72.389" for the first layer, 72.559" for the second layer, 72.729" for the third layer were calculated. The wire continuous lengths required for each layer were calculated to be: 1,568' for the first layer, 1,572' for the second layer, and 1,575' for the third layer. The wire weighs one pound for every 124 feet. Thus three 1,600’ lengths of wire were ordered from Amstek Metal, 1838 New Britain Ave, Farmington, CT 06032, 1-800-359-2930. 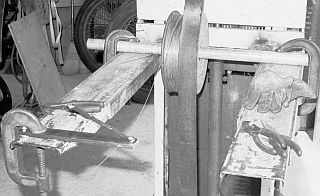 The wire was shipped loosely coiled and to facilitate the wrapping operation it was transferred to a spool as shown in the photograph. The Stanley’s wrapped their boilers with 25-pounds of tension in the wire. This is accomplished by passing the wire through a pair of metal plates that can be clamped on the wire thus creating friction and resistance. In the photo above is the supply spool of wire with a leather strap over it to act as a brake. The wire feeds from the spool and through two 1” wide steel plates which add tension to the wire as it is pulled and wrapped onto the boiler.